Clear Path Technical Solutions, Inc.
We pride ourselves on being responsive to our customers, and providing a single point of contact for all your computing needs. Please use the contact information below to reach us. The Principal Consultant will coordinate with our partners, and can communicate directly with any of your other service providers, if you wish. This will save you time on hold with other Technical Support departments, and gives you an advocate who can clearly communicate any technical issues, to speed up the accurate resolution of any problems you may encounter. Copyright 2007-2014. 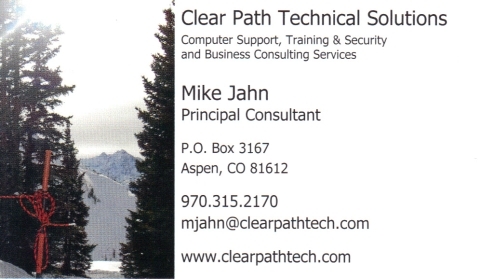 Clear Path Technical Solutions. All rights reserved.